"Fantastic tool for the office"
the ease of access and the unlimited space is exactly what our office needs. the system allows us to share and store client documents with ease. we are able to more quickly locate client documents from any location that we have access to internet. our time is better spent working more and searching the office less for physical files. there are a few personalized options that we would find useful that just are not available yet. i have asked tech support to put it into suggestion for future updates. for example, adding a password to a file or folder, and mass deleting certain folders. definitely consider digitizing your documents. it saves space and increases efficiency. just take your time uploading everything properly. i just wish we had hired a professional team to handle the bulk of the initial digitizing process. we have digitized 75% of our files, we will be finishing the other 25% this summer. it has allowed us to access client files from any location with internet, we can take more work home, we are not wasting time searching for files, we will be able to open up a second location once we are 100% digital. it has also allowed us to expand our current workforce and continue to accept new clients. Thank you so much for taking the time to leave us a review. It's great to hear that we have been able to help your business digitize 75% of your files so far. We're excited for some upcoming features launching soon that will improve the user experience even more, and we look forward to providing continued support for your business! "Organization and Management of Documentation with feature rich suite of administrative goodies. " Document versions and revisions are a breeze to navigate and collaborate. The OCR/Search function is amazing along with the automated zonal forms. There is nothing I dislike about this software - If I'm going to be critical, I would say the workflow features could be simplified with plug and play templates. Most small cap companies could use 'guidance' in the workflow arena whereas mid to large cap operations and workflow are more complex and this software really handles that function amazingly. The more you dive into the software the more you will discover its capabilities. You will be surprised to learn that efile team has really thought this through. Access and efficiency to everyday/critical documentations has saved tremendous amounts of time and administrative headaches. Most of the time when we are in need of critical documents at a moments notice, we are no longer hampered by search and locate hurdles. eFileCabinet has been an absolute lifesaver to our business. We started using it about 2 years ago and by using it, we have finally dug ourselves out of all our paper! We are in the health care business which means that paper is our best friend. By utilizing eFileCabinet we can easily store, monitor and maintain our records. Once that form is uploaded, I know its safe and it will be easy to find again. There is nothing I dislike about this program. It was definitely daunting to think about all the paperwork that needed to be uploaded, but once we started it was an easy process. Don't be afraid of the startup process--you can do it! You will thank yourself in the end! We are solving our "drowning in paperwork" problem! We used to have to file paperwork and hope it was there when we needed it again, now we know it is there and easy to find! "eFileCabinet - Efficient, Organized, and Large"
eFileCabinet has given our Bookkeeping business the ability to store, scan, and easily retrieve tax and bookkeeping documents for future retrieval and printing needs. it has reduced physical document storage substantially and has never let us down when retrieving client documents. Never crashes, is affordable, and the solution for the financial services market. I don't however like the inability to merge PDF documents together within eFile Cabinet. It would be extremely beneficial to be able to merge documents already scanned in. The append feature while scanning is amazing, but not so great after documents have been saved. Investing in EFileCabinet will propel your storage issues, archiving needs, and drive client reliance on your business to do and save what it needs to. EFileCabinet is the solution your office needs. We are solving major storage issues of hard copy documentation that we need to keep 5 to 7 years for legal purposes. This management solution allows us to digitally store documents permanently in efficient space, retrieval basis, and reliability for our clients needs. It has saved us thousands of man hours and valuable storage space. "Great way to get organized"
I like the convenience of having all my documents in one place and easily accessible. In addition, I am able to access my client information and documents from anywhere. There have been times where we had documents disappear because the program was unstable and the document was not able to be checked in or our properly. In our move to being a paperless office several years ago, we researched many companies and we found that eFileCabinet hit most, if not all, of our "want" list items. The entire office can access client information, reports, documents, etc. in one place with ease. I love that it is easy to use and I can access my information anywhere, especially when I am out of the office, which I was unable to do before eFileCabinet. "Fast, easy access to important documents." I own a financial advisory firm. While I have an excellent CRM system eFile Cabinet lets me organize and store important client and personal documents. They're secure and accessible from any online device. I also store reference material (own Financial Advisory Firm) media article, etc. Went paperless four years ago. I wanted to eliminate my clients' personal information which I have acquired over the last thrirty years. Nothing really. Does what I want and the few times I needed support I received it immediately. Very pleased with this product. Great for storing any digital file in a secure environment. Easy access from any internet connected device. Easy to use. Very pleased with this product after four years. Easy access to business and personal information. "Good system. Intuitive to use. Some problems"
When Im saving documents to efile it can take a very long time if the file I'm saving to is very large. If we have clients who have a lot of documents- especially jpeg. files it can take up to an hour or longer to print them all to efile. It's much easier to print out the documents physically, scan them and save them that way. "Secure Document Storage with Extra Features"
Ability to send documents with passwords, restrictions, time limits. Search tools make it easy to find documents. Assignment abilities mean you can assign documents to coworkers. Prepend, Append, Overwrite - these features when scanning make it easy to correct or add to current documents. I'm not a fan of their partner program SecureDrawer - I find it confusing and difficult to use. You can't grab a file while composing an email - you first must go to eFileCabinet and choose the file(s) you will be sending and choose the option to send in an email. Then you can only work on that email, you cannot go to Outlook or look at other emails. This was frustrating at first, but I've gotten used to it now. Pick a naming convention that makes sense for sorting. This will sort it by year first, then month, then day - makes it very easy to sort and view documents. We needed somewhere we could store our documents that we knew would be secure but also accessible to all staff - efilecabinet solves that. Each staff member has a login and can access the files from their computer - they can also scan/save/email based on the restrictions we put on them. That's great for keeping certain documents secure without having to use a entirely separate system. "Solid product with great customer service"
I love the ability to file documents digitally by using the print feature. Being able to search for specific content anywhere within files is also a great help. The Zonal OCR app is wonderful for saving time when naming and storing the same type of file over and over. Occasional print jobs "stick" in the sidekick app, and need to be manually cleaned out. Zonal is quirky and requires some dedication to really make it work. However, there are constant updates to the product that I think will eventually smooth out most of the kinks, and there is excellent support when I run into issues. I changed cities, and was able to keep my job with the company as a result of digitizing our processes and storage with efile cabinet. "Easy to use, but they got me over a barrell"
I was using efile cabinet for several years an then, of course, the software I purchase had to be upgraded for an additional fee and then a couple years after that, they significantly raised the annual subscription. Now, I have all these documents stored in efile cabinet and it would be a project to move my documents to another program. So, they have me over a barrell with their increasing subscription costs. This is a great system for storing and managing documents, just be prepared to be married to it for years to come. I do like having a central location for all my documents that is easy to use and understand and can be backed up on a regular basis. eFilecabinet has truly been a life saving software for our office. It brings smiles to our faces and a peace of mind to our souls. If someone is looking for ways to maximize time and efficiency while being organized then this is you key to success. We could not process the large amount of paperwork that comes through our office and be effective without eFile. We really do not have many negatives things to say about eFile software, we use it on a daily basis about 7.5 hrs of our day. It is very seamless, and beyond easy to use. You can't go wrong with your decision to team up with eFileCabinet, their staff is fantastic and it is a seamless process to get started and be able to manage. Efficiency profitability, space, and organization skills. I like that it is web based and user friendly. I dislike the concept of monthly availability based on contract. When services are no longer needed, the information can no longer be accessed. I would rather not be able to edit or add additional information, but be able to access everything uploaded prior to ending services. This avoids the need to find storage for the files, which could be done oppose to obtaining the services initially. The business problem is storing inactive files that need continual access. The benefit is the immediate access and availability. "E-File Cabinet - Big company service for the smaller firm"
Ability to search for client or documents. Flexibility to change templates as needed. Their mobile app needs updating as it doesn't work with the latest releases. This would have been a good thing for them to have completed BEFORE tax season. I am able to store and retain client documents in a secure manner while still being able to retrieve them from anywhere I log in. "On-line eFileCabinet is FINRA approved and is easy to work with." I have eliminated paper and able to retain and store information that I had to keep in filing cabinets in the past. I can find records without having to get up from my desk. There are some functions that have to be done on the main site instead of the "Side Kick" mode. I have eliminated hundreds of paper files that I kept in the past. As a result, when I moved my office I didn't have to get a larger office to accommodate all of my clients records. "Excellent solution to create a paperless office"
I love the search-ability of documents. I can find documents based on minimal information. I can save documents with many profile fields and the fields can be edited, added, and removed depending on our company's needs. Search by date, $ amount, payment number, check number, name, etc. The layout could be a little easier on the eyes. It seems that the layout could be improved. Maybe the font size/style and also the few graphics/images that are visible could be improved. Images that would help a first- time user be able to navigate the system a little easier. Make sure you have enough licenses for your facility. We occasionally have issues with too many users trying to access efile and not enough licenses. We are in the process of obtaining more, and expanding so that our nursing department can also utilize efile cabinet for their needs. We no longer have to keep hard copies of payment information. We are saving hundreds of pieces of paper a day. The workflow with approving documents is seamless and has greatly increased our efficiency. "Don't know what we'd do without it"
The biggest benefit for our office is the ability to share files between different users in different locations in a secure way. Sure, you can transmit stuff through email, but that is not as secure and does not meet the regulations we are required to uphold. Backing up the files can take a long time and needs to be coordinated after hours etc. Organization, easy to build cabinets, drawers and folders. Templates are very valuable as well. Other than what I have listed in the "dislike" section, which is a major hit, everything else is great. Upload speeds are superb, scan features are excellent - regulated only by the speed and quality of your scanner & Internet connection speed for the upload. They have recently introduced a web based version of the software, the previous version - which is still very usable and available - is based on Microsoft Silverlight which does limit which browser you can use (Chrome is out, but Firefox and IE are in). I have no issue with that small nuance. Bottom line is, we would not still be using the software if it was not a quality product. We were their very FIRST cloud customer! We currently have almost 100 users, and with support being part of my responsibility, it now takes very little of my time., The company has matured, and we have been along for the ride, and it has been a pleasure. As mentioned in the previous section, I am the Admin of our eFileCabinet subscription, We have 18 offices throughout the state, and while it allows for that type of volume, I regularly have to remedy permissions that change - literally on their own. For example, on any given Tuesday afternoon everything is fine. However, I come in Wednesday & overnight Office 1 can now see Office 4's data, and Office 6 can see Office 10's data, and so forth. The only permission that gets modified is the "View" permission. No editing, moving or deletion allowed, but we are mandated to stay in compliance with HIPAA regulations and this is a big issue for us to deal with. Other than that, which is a major hit, everything else is great. When that problem gets resolved, and if history holds, it will, I would recommend it to anybody and everybody. Increasing organization while reducing paperwork. Easy to train users. Although nobody likes to be audited, it is part of our industry. So now an auditor can come to one location, the corporate office, and audit any or all of our offices. In the past, we would have to get a listing of what the auditor needed from one of our offices, then that office would have to gather the data and FedEx it to us. Now I just create a login for the auditor, copy the requested records from their static location in eFileCabinet, to the auditors cabinet/drawer and everyone does their job. "eFilecabinet has a great vision but needs work to become an industry standard." Their software support is great. The basic vision of the software and layout of the software (especially the latest version) is done very well. Our company has 7 efilecabinet online users and we all dislike the new changes for "storing and saving as" for imported documents (print, scan, upload). All imported documents have to default to one folder instead of letting you choose "save as" where you would like to store the document(s). This option used to be available and now it isn't with their new sidekick and 2.0 software. I have spoken with their support teams for over a year now and get the run around that this will be brought back in a future version yet isn't. It seems unnecessary to change the workflow that worked efficiently for many. Especially for the price that is charged for this software. Other items that are disliked are the install and configuration process of the desktop client(s) of the legacy software and for the new 2.0 software (sidekick, etc). Many times, things don't install correctly and you have to go on google to find out why, or contact their support, or a new windows update breaks the efilecabinet scanner or printer. It's very disappointing to have to allocate our IT resources to these items for the price that is charged for this software. They have a good vision but the software isn't quite there yet. The installation is a hit or miss, and juggling back and forth between the desktop sidekick software and the web browser and having to hit refresh is very confusing to the users. Not being able to choose where an imported document is stored and being forced for all imported documents to be stored in ONE folder is very disappointing and annoying too. So please consider these items before purchasing this software which comes at a pretty high price which should include the above instead of exclude them. We have gone paperless using this software which is a huge benefit. We can search documents, search for documents, etc instead of having to file through a file cabinet. "I had a terrible experience with this software and I would not recommend it. " I do not like this software at all. I had nothing but issues with it from the very beginning, literally spent entire days working with their tech support people and it still didn't work. I switched to another solution even though I'm paid up with eFileCabinet through April - it was costing us too much money in time and productivity. The sync tool didn't work, it crashed my computer constantly and I spent days with tech support and it still wasn't fixed. My remote workers couldn't access files because they never syned. None - I thoroughly detested this software. Also, by their own admission - they messed up my monthly billing, and did not bill be for several months in a row, then when they tried to bill me a huge amount at one time it didn't go through on my credit card and they shut me down without any notice, again causing me huge amounts of lost time in productivity. When I finally managed to talk to the Accounting Manager he admitted that it was their mistake. The ease of moving files from one location to another. No matter where the file is you can drop it into a cabinet and it will move automatically. I like the fact that I can control what cabinets, drawers, and files my co-workers and customers can see. I have total control over all of my documentation. Also, if a customer requests a certain document, EFC makes it simple with SecureDrawer. Excellent software and so thankful for it. The only dislike I have is that when you move a file, it doesn't ask if you would like to delete the previous location of that file. You are moving a copy of the file, not the entire file which I think would be beneficial. Once you have it installed and you begin to work with the features, you will be amazed at the ease of use the software really is. You will find that you are spending less time looking for documents and actually doing more work if that's really possible. It's a great document manager and I am thrilled with it as well as my co-workers and upper management. I believe you will be too. We had a really big problem with version control of our documents. That no longer exists since we instituted EFC. Also, it is so much easier in searching for documents instead of going through all the folders and locations on a personal computer. It is very easy to use. Initially I had some difficulty figuring out the file structure I wanted, but learned that with the robust search functions, simpler was best.The videos were espesially helpful, as well. Things tend to get a little hinkey when there are updates, since some of the settings tend to get reset to default. However, the service team has been prompt to respond and either help to reset back my choices or explain how to work with the new default settings. For a small firm like mine, this is a really good value. Filing is easier/quicker. And locating documents once filed is very easiy. It is great to hear that we are able to provide great value for your business and that you find our service easy to use. We're excited for some upcoming features that will make the user experience even smoother. Thank you for taking the time to leave us a review! "The Best Tool I Ever Purchased"
My only issue is that I can't seem to verify that the OCR aspect is working. But I haven't contacted Customer Support about that yet! The quality of the software, scanners, and customer support could not be any better. It is so easy to learn and implement. You will LOVE putting all of that paper in the shred pile! The flexibility for the solution to handle multiple different department needs in one product is amazing. It is easy to setup, train, and manage. We were able to satisfy the needs of multiple departments and organizational leaders needs. Teams are now working in the way they want with the security management wants. The product could evolve to handle a greater level of complexity with template file creation and workflow management. It is strong in this area. However, we have run into a few situations where our needs were more complex than it could handle. We were trying to unify the entire organization into a single electronic filing solution. It was able to handle those needs well. It also gives us a way to securely share information with outside sources, so it eliminated the need for Dropbox/FTP type file sharing. "eFile is great for keeping everything organized in one place"
Not the easiest to combine folders, sometimes has issues loading and it is kind of slow, which is likely due to the amount of information we have in it. Make sure to keep things organized and don't accidently create duplicate files that you will have to clean up later. We keep all employee documents here as well as paper copies. This is much easier and quicker to reference a specific document for a specific employee than it would be to go find their paper file and look through it. The ease of filing and retrieving. The fact that all documents are now in one place and everyone can view them. The colors. Would be nice to customize the filing cabinet colors. With all cabinets being the same color, it's hard to find what you are looking for easily. You won't regret your decision with choosing eFileCabinet. Easy to use and great customer service. We are now able to find our files easier. Everyone has access to the files and can retrieve them by themselves without asking me for the paper copy. I can store all the files i need right in eFileCabinet and find them with ease.. The files can be PDF, e-mails and so much more. Works well with my bookkeeping and tax cleints. Plus it is secure so both my clients and I can access 24/7 in the cloud. Haven't found anything to dislike yet. If you are looking for a secure and safe electronic filing system, this is the one to choose. Reliability and support are excellent. They offer live and recorded webinars to make it easy to train staff. You can also print materials for in house manuals. Works well for all types of files and allows your to customize the types of filing system you want, but with an easy to use search feature for all types of documents. Allowing my tax and bookkeeping clients 24/7 access to documents that they need. Protection of my files in case of natural disaster. "Utilized in a tax and financial services business"
It is easy to store items from anywhere without scanning. I can also add commentary on the document that I am scanning to help me later remember what I did. It is preferred by my broker, HDVest Investments, and has a level of security. I do not do templates very often (once a year sometimes) so it is hard to maintain functionality and I need to call support usually for help. There is so much in it that I do not use it to its fullest capabilities. It takes a little time to work it into your own company needs and wants but it is very easy to use. Storage of old documents requires a lot of space which I can now eliminate. "Great Product for Document Retention and Privacy"
I like that you can like drawers and only give access to specific users. This really helps us with HR documents that need to be kept confidential. I don't like that the look is very outdated. I highly recommend eFile. It is essential for HR and Legal departments. We solved the issue of confidentiality with HR documents. I didn't realize how organized it would help me become. Keeping everything in drawers, then folders underneath really helps me to be able to separate and label everything down to the smallest detail. "Easy to learn, keeps the office organized"
We love the ability the quickly create new client folders based on templates, as well as knowing who created content. The security of only allowing information on a need-to-know basis is fantastic. We don't like that we can't attach documents to an email when starting from Outlook. The email has to be started from within eFileCabinet. We use eFileCabinet to organize tax and accounting e-records. We find it has helped us to quickly and efficiently store electronic records, keep telephone logs and notes, and encourage adoption by all users. "Great way to store and file your documents safely"
It's easy to install and maintain. The interface is easy for our employees to understand. Searching is intuitive. It's easy to store documents, just click print and choose the eFileCabinet printer. Seems to be a bit overwhelmed when you have too many users logged in at once. Get to know thier support team. They've helped us a lot with questions, upgrading, troubleshooting, etc. We needed to store important documents related to our customers. This is a safe way to do so and makes searching from them a breeze. "EfileCabinet & Hyperride Technologies Solutions"
Software, User Interface is user friendly. The mobile app is fast when searching. Lack of pre-sales information that can be used by partners when attempting to acquire new business. this product will greatly enhance workflow and increase productivity. good source for external access from your clients to their data. Fix lack of workflow. Improve office staff productivity. Increased overall security of data handling. Provide backup for cloud solutions. Business practice streamlining. "I love the concept of auto filing documents using the zonal OCR"
I obviously like the idea of having all my files stored and organized on the computer rather then in actual cabinets, it make the process so much easier, it takes a second to find any document throw their search engine, easy to share it with your boss, colleague or customer. But what I really love is the Zonal OCR engine, that files all the files for you, you tell the software what to look in the documents and how to file and it does just that, saving hours of hard work! Talking about the Zonal that i love so much, in my opinion the software has a lot to improve still in many ways, a new version was just released and it has great improvements, but there is still a little way to go..
"Software is not working for us the way they presented that it would wokr"
It appears to be a really great system for archiving and storing files. The sales rep told us that it would work for what we needed it to do, but we have spent several months talking with various people at eFileCabinet and we are still trying to figure out if it will indeed do what we need it to do. We have had several communication issues as well, where we got different answers from different people, or people not communicating to each other at eFileCabinet. This software also does not come with a great digital approval system (need to purchase additional software). We are trying to digitize the process of matching invoices, packing slips, and purchase order that come in to a variety of different locations. We are also trying to get digital approves on all invoices and purchases orders. We have not been able to even get it set up with our information because we aren't even sure this product will work for us. I like the file drawer concept. I am a very visual person and being able to see the file cabinets, drawers and files make it very easy to navigate. So far, no dislikes regarding the product itself. I would definitely look at this product. Our previous document management program made it difficult to search for documents and any time we had a problem or needed to make a change, we would have to wait sometimes up to a week for the company to make those changes for us. eFileCabinet is very straight-forward and it is simple to find what you are looking for. We have more control in our set up and if changes need to be made. Also, the customer service is great. "Easy Secure Filing System "
Recent price increases were not appreciated. Frequent and often unannounced upgrades make it difficult for clients we share this with to get a consistent experience. This product is so easy to use and so practical, you don't need special hardware to use this product, you can just install it on any server and your good to go and all their files are saved as pdfs. also it is at a fraction of the cost that other eFile programs charge for their programs, plus they require special equipment. Get it by far this is the best eFile Solussion out there . to start we eliminated the 10, 4 drawer physical cabinets, we clear lots of storage room, we utilize that space to put al least 2 more Desks. "Great Software for Most People's Document Imaging"
eFilecabinet uses the same methodology as a regular filing cabinet uses. This makes it incredibly easy for the end users to use. Very little training to let people find the software. Apps for IOS and Android is nice so users can access the files from wherever they are. The cloud version is nice but at times it can run slow even with good internet. Single sign-on using either Google Apps or OAuth would be preferred. I highly recommend it. Easy to use and very affordable. eFileCabinet allowed us to digitize our documents and have access to them wherever we needed them. It was very cost effective and very easy for the users to get up to using. Our users love it! "Great for tracking - eliminates having other email boxes"
I had a hard time thinking of anything I dislike, but sometimes it's a bit slow uploading and saving files that are large. Be organized and save files with names that make sense so you can find easily when needed. Archiving documents and correspondence. I don't have to save anywhere else, and can retrieve when needed. Our team can also fine if I am not available. That is an innovating system and the suport they provide is excellent. Maybe the capacitation plan they have, all by documents and videos. Maybe we could have live sessions with other companies. On the other hand, all the documentation, videos and even the software aren only available in English, eFileCabinet is a company that should be thinking on selling their products around the world. We are in Nicaragua and not everyone know english. As a financial company, client documentation is really important. Now we are having more control on documents, we have streamlined our procesess. "I have complete access to all my documents in a organized environment"
I'm able to locate any of my documents with key words, as if it were stored on my computer, but in a secure location. I like that I'm able to upload documents to my Secure Drawer for people to access as well as how it is connected to Right Signature. The accessibility makes life a lot easier. Secure Drawer has it's perks being connected to EFC, but sometimes it's not the easiest to set someone up. It will occasionally not send an invite and it leaves me stumped on how to move forward. We are able to keep all our files in a secure location, we've gone paperless and rely heavily on it. "Great system, room for improvement"
Customer service is fantastic. Platform is simple and easy to navigate. "Very easy data storing software"
The best thing I like about E-File is that the software is user friendly. I have a virtual file cabinet on my desk and can access information with a few clicks. The thing I dislike is creating templates can be pretty confusing. And sometimes the user moves information without realizing they did it. E-file provides our company with accessing documents with a few clicks. We no longer have to keep hard copies of files in the office. "Very happy with E-File Cabinet"
documents during a snow storm. On another occasion I was unable to get to my CPA's office. eFile Cabinet saved the day! Initially, I had some technical problems getting started. But the staff at e-File got me through the brief start-up process. It's great, convenient, use it! Getting my documents securely and efficiently to my accountant. It gives me a way to organize my data as I want. It is easy to move any kind of file into the database. I have to run files through the desktop to get the non-scanned files into the database. Give it a look. It works for me. I can keep a client's data and information organized and it is easy to access. I have used since 2003. Thanks for taking the time to leave us your feedback. It's great to hear our service works well for your business. 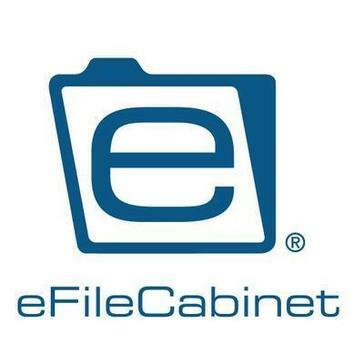 "EfileCabinet is the best filing system for any business"
"Great software design to replace physical filing cabinet"
I love the simple design, modeling it after a filing cabinet so everyone can understand it. Drawers > Folders > Files. Drag and drop feature allows you to move files easily from different folders, programs, your desktop and file manager. Folder templates allow you to easily set up standard folder structures to use for all drawers, or only the ones you choose to apply it. Makes everything look very uniform and familiar, no matter who is using it. The few faults I have found with eFileCabinet are minor, but sometimes disrupt the flow of my day. For example, I have yet to find a way to scan documents and have them applied to the folder I am currently in. When I scan them and click Store, it always brings up the search box, and then I have to search for the drawer/file I want to store them in. Another fault I have found that is quirky is that I am not able to drag files attached to Outlook emails into eFileCabinet. I have to save them, then drag or import them into eFileCabinet. This isn't a deal breaker, but would be nice if it allowed me to drag them, as most other programs do. - Easy access to files without needing to dig through drawers or unfamiliar/unorganized folders. - Less paper, if used properly, as many things don't need printed, but just stored under a client's folder. - Easier, quicker access to files/documents if a client requests them. No longer need to pull physical file, scan and then email. I like the ease of how to store files to this product but more important I like how easy it to retrieve. It doesn't take a lot to train support staff to use the scan and retain function. Anytime we have had any issues calling is easy and service is great. I wish we had the ability to easily connect more scanners and use the program, but some of that may be our set up as well. Great product to use to store documents- I feel the system is secure, and use is easy. We really have been able to reduce the piles of paper in filing cabinets. We have literally gained space in our office because we have disposed of filing cabinets! * We monitor all eFileCabinet reviews to prevent fraudulent reviews and keep review quality high. We do not post reviews by company employees or direct competitors. Validated reviews require the user to submit a screenshot of the product containing their user ID, in order to verify a user is an actual user of the product. Hi there! Are you looking to implement a solution like eFileCabinet?